LAFAYETTE, Ind. 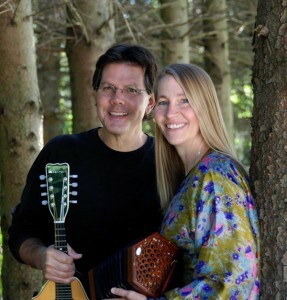 — Traveler’s Dream, a West Lafayette based folk music duo, will perform a holiday concert and host a CD release party on December 19 at 7:00pm at the Unitarian Universalist Church 333 Meridian Street in West Lafayette, Indiana. The concert will feature music from the duo’s new CD entitled Cold Blows the Day: Songs and Carols of the Winter Season. Rich vocal harmonies and various combinations of guitar, Irish flute, mandolin, concertina, bouzouki, and tin whistle will capture the spirit of holiday musical traditions from the Celtic lands, England and France. Classic favorites rooted in Old World Europe include I Saw Three Ships, Good King Wenceslas, and Bring a Torch, Jeannette, Isabella. The concert will also feature some of Michael Lewis’ original songs from Cold Blows the Day. His poetic lyrics will strike a chord with everyone who shares his love of midwestern winter landscapes and his appreciation of the magical qualities of the winter season. Several guest musicians will join Traveler’s Dream in making this a festive and memorable holiday event. Warm wassail and seasonal treats will be shared at a reception following the concert. Tickets are $8.00 for adults, children 14 and under are free. Copies of the CD will be available for purchase at the concert and may also be purchased directly from their Web site.